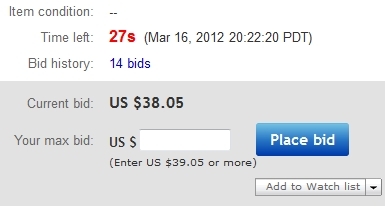 eBay sniping is simply placing your bid on auction seconds before it ends. I believe sniping, if used properly, can help you win more auctions and help you save money. You don't need anything special to snipe on eBay. All you need to do is wait until the auction you're interested in is about to end and place your bid manually through eBay. Anybody can do this and a lot of people do, believing that they have a better chance of winning the auction. If you do not want to be at the computer when the auction ends, you can use eBay sniper software to snipe for you. Sniping has become popular so there are numerous companies offering sniping services. Some offer software that you install on your computer. Others offer internet sniping services. The biggest advantage of using sniping software is that you do not need to save your eBay credentials on some server. Your credentials are stored on your local computer. Other advantages include having more control over your bidding. If you change your mind, you can cancel your bid close to the time when your snipe is scheduled. Disadvantages include the need for your computer to be turned on and sniping software running when it's time to place your bid. Also, if you have power outage or you lose internet connection, your snipe will not be placed. The biggest advantage of using web based sniping service is that you don't need to have your computer turned on and you're not dependent on your internet connection. Disadvantages include the need to store your eBay credentials on sniping server. This means that your user name and password is stored in some database where it can potentially be used without your knowledge. You also have less control over when you can cancel your snipe. There is no right answer to this question. This depends on your preferences. Some people prefer using software, others prefer using website. I've used both. I've used web sniping service for many years and I've been using my software called Buyer Auction Manager ever since I added Sniper module. My computer is turned on almost all the time anyways and my internet connection is reliable so it works well for me. Placing your bid on eBay auction in the final seconds allows you to avoid bidding wars. It prevents others from increasing their bid if you outbid them because there is not enough time. If used properly sniping can help you save money and win more auctions. Placing your eBay snipe one second before the auction ends is not the way to go. If you do this, you'll lose auctions that you could have won. Best way is to place your bid when there is not enough time for somebody who's bidding through eBay to increase their bid, but early enough so your bid is placed before other snipers. I've lost more than one auction even though my bid was higher than the person who won. How come? eBay uses proxy bidding so your bid needs not only be higher than the highest bidder but also it needs to be higher by bid increment. This means that if maximum bid of the highest bidder is $1100 and that's the current bid, for your bid to be accepted, it needs to be $25 higher ($1125 in above example). I usually set snipe buffer between 5 -7 seconds and it's worked well for me. When you use eBay sniping software or web sniping service, there is always a chance that your snipe will not get placed. If there is an item that you need to have and cannot afford to lose, just place your maximum bid through eBay. Also, if the seller lists an auction at market price and there is not much interest, you might as well place your bid directly through eBay. Finally, if current bid is close to what you're willing to pay (one or two bid increments from your maximum price) you have a better chance of winning that auction by placing your bid early. Sniping, if used properly, can help you win more eBay auctions and save money. Snipe at a time when regular user does not have enough time to increase their bid but early enough so your bid is placed before other snipers. 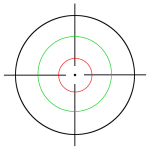 If you'd like to try sniping for yourself, check out my eBay Sniper Program. It comes with 30-day no obligation trial.